Abstract: Sustainable Development Goals (SDGs) are viewed as an overarching development framework. Among the 17 SDGs, four (Zero hunger, No poverty, Climate change and Life on land) are directly related to agriculture and this paper explores the roadmap for realization of SDGs by 2030 in Indian context. The developing nation is a home for around 172 million people living in extreme poverty. Agriculture in India, being the main occupation and prime source of income for a majority (58 %) of rural households, its improvement will enable trickle down favourable development agenda. Value chains in agriculture has untapped potential of inclusive growth, reduced inequality and decent jobs for many. Infrastructure, innovation and industry linkage are imperative. Migration, informed interventions by State and other actors leads to feminization of agriculture improving gender equality. Zero tillage, biofortification, expanded food-basket with nutritious cereals, biogas and bio-manure, and efficient water use can help to achieve food and nutritional security. Renewable energy use, besides mitigating climate catastrophe, will create opportunities for investment, growth and employment. Farmer’s resilience to climate change shocks needs to be strengthened by weather information system and crop insurance programmes. Biomass based power generation will rise by more than five-times to 120 TWh in 2040, providing a reliable rural electricity supply. Agriculture account for 17.6 percent GHG emissions and its yield is negatively impacted by climate change making it a cause as well as victim of climate change. Hence, climate-smart agriculture should be the top priority for zero hunger and no poverty. Set goals need to be followed and addressed through an integrated scientific, technological and social approach where the policy makers not only be given the responsibility but vested the onus of achievement shared and cherished by all participants. 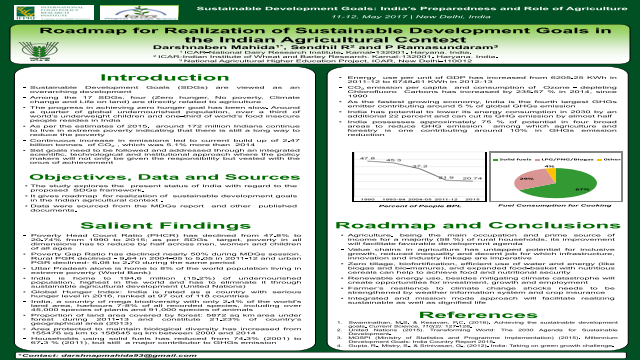 The suggested approach will facilitate to realize sustainable as well as dignified life.Summary: Poster presented at the National Conference on Sustainable Development Goals: India’s Preparedness and Role of Agriculture organised by TAAS-IFPRI-ICAR at NASC during 11-12, May 2017 | New Delhi, India References: 1. Swaminathan, M.S. & Kesavan, P.C. (2016). Achieving the sustainable development goals. Current Science, 110(2): 127-128. 2. United Nations (2015). Transforming World: The 2030 Agenda for Sustainable Development. 3. MOSPI (Ministry of Statistics and Programme Implementation) (2015). Millennium Development Goals: India Country Report 2015.